"With the summer heating up, there's no better time for some dance music, and this congregation of musicians from Either/Orchestra, Bim Skala Bim and other Boston bands have just the thing with their revival of bugalu, the explosive '60s Nuyorican mélange of various Latin and African American styles." Lookie Lookie returns for a hot night of Latin Bugaú! Represents the Boston area debut of two new members, bassist Edilio Bermudez and trumpeter Eric Ortiz. Fans know that Lookie puts on an entertaining show full of irresistible melodies and rhythms, more than a dash of humor, and a warm, welcoming vibe. With strong horn soloists and deep Afro-Caribbean grooves, you can sit and listen - or get up and shake it. You don't need salsa skills to dance to Bugalú - you can free form, rock'n'roll style, or use your best couple dancing moves (if you have some). Lookie Lookie plays Latin Bugalu, a crossover genre invented by Nuyorican musicians in the 1960s. Lighthearted and catchy, Bugalu lies somewhere between the stately Cuban sounds of the 50s and the manic high salsa of the 70s. Top artists included Pete Rodriguez, Joe Cuba and Ricardo Ray, whose tunes form the backbone of the band's repertoire. The band named for an early Ricardo Ray hit, "Lookie Lookie," which encapsulates some of the pan-American fusion that went into Bugalu. Lookie is also delighted to have discovered the terminally obscure George Guzman, who made two LP's for the essential Latin record label Fania - and then disappeared. Lookie plays such Guzman gems as "Banana Freak Out" and "Really Bad Scene." Lookie Lookie is an all-star lineup of Boston music veterans. 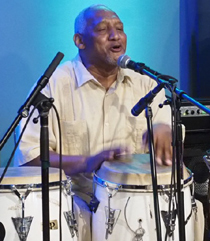 Music director Russ Gershon is a Grammy-nominated arranger for his work with the Either/Orchestra, and has played with Cab Calloway, the Four Tops, and Morphine among others; percussionist/vocalists Jorge Arce and Vicente Lebron are two of the grand men of Boston's Latin music scene; percussionist Rick Barry toured for years with Bim Skala Bim; percussionist Ken Winokur is one third of the Alloy Orchestra, world-reknowned silent film accompanists; saxophonist Ted DeColo has performed with Mighty Sam McLain and many others. Brand new bassist Edliio Bermudez has played with luminaries such Giovanni Hidalgo, Julio Iglesias and Celia Cruz; new trumpeter Eric Ortiz is a member of Boston Rock'n'Roll Rumble winners Eddie Japan.